The Buffalo Field Campaign (BFC) is the only group working in the field, everyday, to stop the slaughter and harassment of Yellowstone’s wild buffalo. 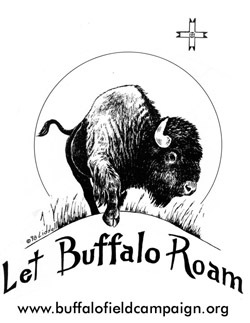 Volunteers from around the world defend buffalo on their traditional winter habitat and advocate for their protection. Our daily patrols stand with the buffalo on the ground they choose to be on, and document every move made against them. Volunteers spend all day, from sunrise until sunset, watching and documenting actions taken against the buffalo. We run patrols from cars, skis and snowshoes to protect buffalo outside the park. Tactics range from video documentation to nonviolent civil disobedience. BFC enjoys incredible support and participation from the local community. Residents allow us to post signs on their property designating them as “Buffalo Safe Zones.” We offer a fence repair service to mitigate damage caused by wildlife. Locals join us on our daily rounds, and many support our patrols with hot drinks and food. All of our work happens because people are willing to take a break from their usual schedules and come help. Over 3000 people from all over the country and around the world have joined us in our log cabin on Hebgen Lake to help stop the buffalo slaughter. We feed and house all our volunteers in our cabin and Gardner satellite camp. (See news article- 4/24/03- Earth Day heroes: Amani Hays). Volunteers patrol for buffalo by skis, snowshoes, or cars. Everyone communicates by a network of hand-held radios, and also carries a video camera. Our office runs outreach programs, including slide and video presentations, summer tabling in Yellowstone Park, website and e-mail updates, and national media coverage through press releases and video. This entry was posted in Make No Bones Shows and tagged Buffalo Field Campaign (BFC), Connecting with Spirit, Indigenous, KAOS 89.3 FM, Make No Bones About It, Montana, Raven Redbone, Stephany Seay, Yellowstone. Bookmark the permalink.